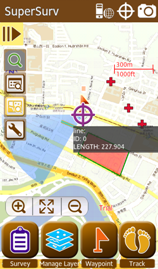 SuperSurv is the mobile GIS for Android devices, which supports field surveyors to overlay layers in tablets or smart phones to collect spatial data, position with GPS, use waypoint guidance, etc. Moreover, the application provides global coordinate system settings and supports to save the collected data of point, line and polygon in SHP, GEO formats for further applications. Support to access and edit feature service of SuperGIS Server 3.1a: After loading the service to SuperSurv 3.1a, users areable to add or edit feature and the attribute data, and upload the updated data to SuperGIS Server to synchronize withall data in the server. SuperSurv3.1a, users can use query tools to know the attribute data of features and also apply feature measurement tool to knowthe coordinate of point, length of line, and the perimeter and area of polygon. Support to access map tile file (STC) generated by SuperGIS Server to enhance the interoperability among SuperGIS products. The built-in Online Map Tool provides diverse web maps: While creating a new project, users can choose Online Map ToolThe built-in Online Map Tool provides diverse web maps: While creating a new project, users can choose Online Map Tool as reference basemap. Thus, users are able to adopt OpenStreetMap or Google Maps as basemap for spatial data collection without pre-generating cache maps. To facilitate global users to collect spatial data and have further analysis applications, code page settings are also addedo facilitate global users to collect spatial data and have further analysis applications, code page settings are also added into “Creating a New Layer.” Therefore, the attribute data in different languages can be read and applied easily.